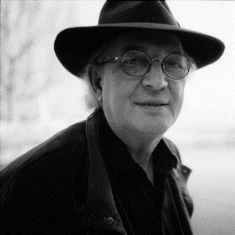 Virginio Ferrari is an internationally recognized Italian sculptor who, beginning in 1966, spent ten years at the University of Chicago as a faculty member in the Department of Art (part of which is now the Department of Visual Arts). By the age of 30, in addition to his faculty post, he was already a sculptor-in-residence at the Midway Studios and had exhibited work at The Renaissance Society. More than thirty of his works dot Chicago’s streets, parks, and plazas, and several of them live on campus at the University. Three of his most visible sculptures are Dialogo, Interlocking, and Caring. Dialogo (1971), outside of Pick Hall, is a bronze monumental sculpture commemorating Albert Pick Jr.; Interlocking (1993) sits in the Laboratory School’s courtyard as a stainless steel interactive bench; and Caring (2015), one of the newest additions, is a massive marble sculpture commissioned in honor of the Bucksbaum Foundation for the lobby of the Center for Care and Discovery at the University of Chicago Medical Center. All of his campus works embody Ferrari’s dedication to civic art’s accessibility and its essential role in the everyday experience of the city. In his statement at a retrospective in 1995, he wrote, “I want to create situations that delight the eye, in the streets and squares and corners of the city. I want the passer-by to be pleasantly surprised to encounter sculpture, as though it were a natural part of the city landscape.” Ferrari still practices in his Chicago studio and in Guardistallo, Italy, and his work continues to surprise city-goers and connect the expansive urban fabric to its people.